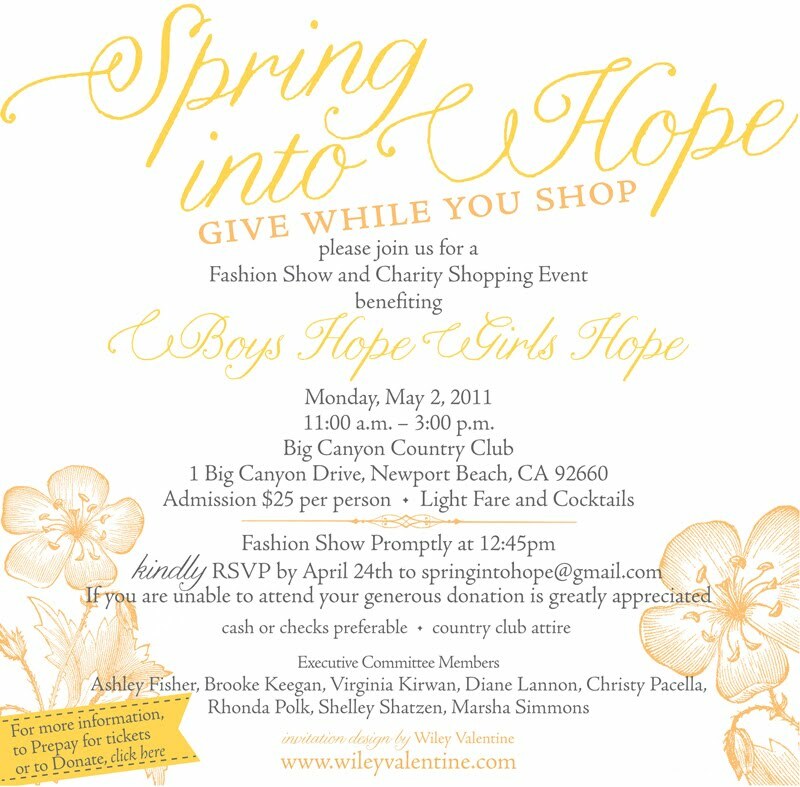 I'm thrilled to share with all my wonderful readers Spring Into Hope, a wonderful event benefiting Boys Hope, Girls Hope. Boys Hope Girls Hope of Southern California helps academically capable and motivated children-in-need to meet their full potential and become men and women for others by providing value-centered, family-like homes, opportunities and education through college. A truly unique organization, we offer these gifted young people new HOPE, a safe haven, a warm and welcoming home, staffed by loving house parents and filled with encouragement, warmth, healing and endless opportunities. We offer these motivated young scholars HOPE - Homes, Opportunities, Parenting, and Education. Boys Hope Girls Hope scholars move into our homes between the ages of 10 and 14 and stay with us through high school. Our family is particularly special. Our kids are so very loved by an extended family that is made up of our staff, donors, volunteers, mentors, board members, counselors, school principals, teachers and more. Our sole purpose is to give our kids absolutely everything they need to achieve their most ambitious dreams. When they graduate from our program, our young people remain members of our extended family for life. The results of this holistic approach are staggering. Since we first opened our doors in 1991, 100% of our program graduates have graduated high school. Currently, we provide support to collegians at Boston College, Chapman University, Johnson and Wales and California State East Bay. This program doesn’t offer band-aid solutions but rather provides the stable, loving home life and educational opportunities that make for happy, healthy, productive citizens. BHGH scholars give back to their communities through volunteer work and participate in extra-curricular activities. Your donation will enable us to continue providing a happy, fun and loving environment for Boys Hope Girls Hope scholars to remember as their childhood. To learn more, become an event vendor, or to become a sponsor, click here. PS - what is that amazing font?